If you’re a passionate cyclist, you know how nothing comes close to riding a bike in nature. You’re looking at those endless fields, rocky mountains, and hills, feeling the rush in your heart and wind in your hair. The question is: how can you transport your bike there? The very thought of putting a bike in the back of our car gives us a terrible headache. As if folding seats down and a dirty car isn’t enough, we often have to take our bike apart so it can fit properly. That’s why a great device like a car rack was invented! We all know how searching for a quality 4-bike rack can be difficult. The things are simple and easy with one bike, but the fun begins when you need to transport all the bikes of your cycling group! Well, all the hassle is about to be blown away with Allen Deluxe hitch bike rack. Its quality and durability allow for a worry-free trip to your cycling adventure in nature. Allen Sports Deluxe rack is designed for vehicles with a 2 inches trailer hitch, and it can hold 4 bikes. The rack is quite heavy, but it's because it has the potential to carry the load of around 140lbs. Powder-coated steel material also gives it more stability and overall durability. While many bike racks come in separate parts that one can assemble only by being a professional engineer, Allen Deluxe bike rack is set up quite easily. It attaches to a car with a No-Wobble hitch bolt that prevents rack to wobble in the receiver. However, you should know that some wobbling happens anyway. Allen Deluxe has a 22 inches carry arm which allows you to secure every bike separately. The rack’s carry arm can be folded down when it’s not in use, which comes really handy e.g. it allows better access to the vehicle when the rack is installed. The rack is also separated from the vehicle with a hitch and therefore there is a small chance that your car will be scratched during the ride. 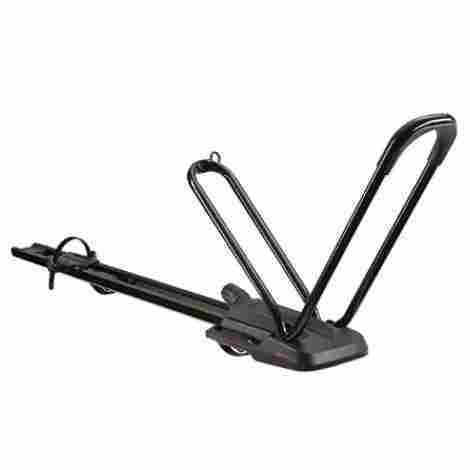 This is one of the cheapest 4-bike hitch mount racks on the market. It doesn’t have all of the high-end features like more expensive products, but it provides great value. 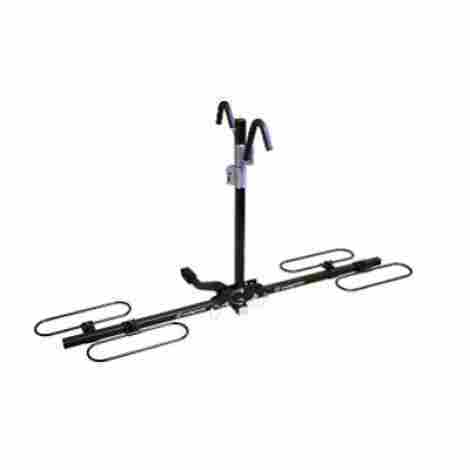 Swagman XC hitch mount rack provides an easy way to transport 2 bikes. The rack can carry on many different bike models such as children's and adults bikes, full-suspension bikes, BMX bikes, and many others. It gives extra protection to your car and to your bikes, so you can relax and completely enjoy both traveling and cycling. If you don’t need a large 4-bikes rack then you can easily go with Swagman's carrier, which is probably the best 2-bike rack on the market. There is no safer option out there, especially because it provides double protection – every bike is secured at the frame and both wheels. Not only that you get to transport the bikes safely, but every thief would be devastated by this lock mechanism. Swagman XC also has two upright carry arms to hold the bikes in place. They are cushioned with a soft coating to protect bike frames from scratches. It can also endure 35lbs for bike or 70lbs in total, which is quite good. Swagman’s other great feature is its user-friendly design. You don't need to spend hours to set it up – attaching it to a vehicle takes a few minutes, as well as taking it off. Additionally, the carry arms can be folded up for better access to the trunk. Swagman XC is compatible with 1 ¼ inch and 2 inches hitch receivers. Assembling the rack and mounting the bikes takes a little effort, but it’s not complicated at all. Overall, you shouldn’t have any difficulties. The ride should be safe because of the anti-wobble bolt that holds the rack tightly to the receiver. However, some users complained about the rack's unbalanced position. It seems that some extra effort is required to make the rack firmly attached to the hitch. If you are searching for a sophisticated but also a simple way to transport your bike, then Swagman XC may be the right choice for you. It’s not the cheapest option on the market, but it gives excellent protection and security for your bikes. 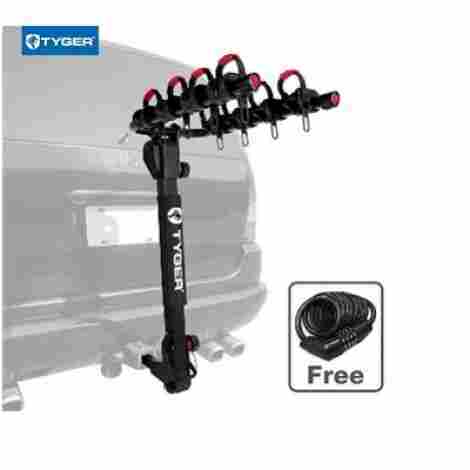 If you are planning your vacation and searching for a good bike rack to transport up to 4 bikes for your friends or family, Tyger bike carrier is an excellent choice. It features some great safety measures that allow you to travel without any worries. 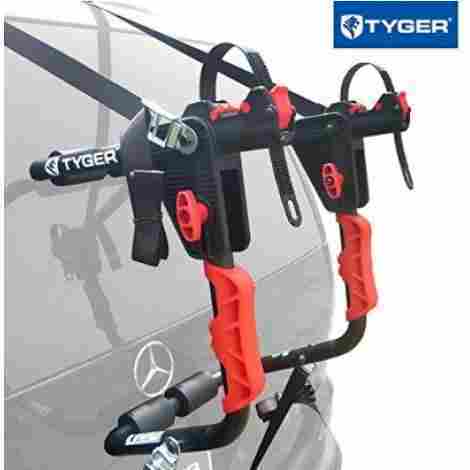 Tyger bike rack is designed to provide the maximum level of protection, featuring cable lock, hitch pin, and safety straps. This carrier is rock solid, holding bikes firmly in place. Additionally, it’s covered by E-coating black color that provides rust resistance. The main drawback is the lack of anti-wobble components. Even if we noticed that some wobble happens among almost every high-end bike rack, the chances that this might happen are bigger when there are no anti-swing segments. 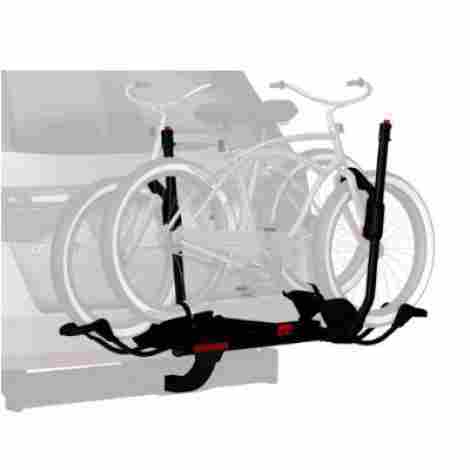 Just as with the two earlier reviewed products, Tyger bike rack can be folded down and simply attached to the vehicle. You need just a few screws and a wrench, and after only a couple of turns, you’re set to go! The installation of the rack is quite easy, but you should keep in mind that it’s not suitable for vehicles longer than 18 feet. Make sure that your vehicle fits into this category before making the purchase. Other than that, it fits in both 1.25 and 2-inches hitch receivers. Tyger bike rack provides great value for money. 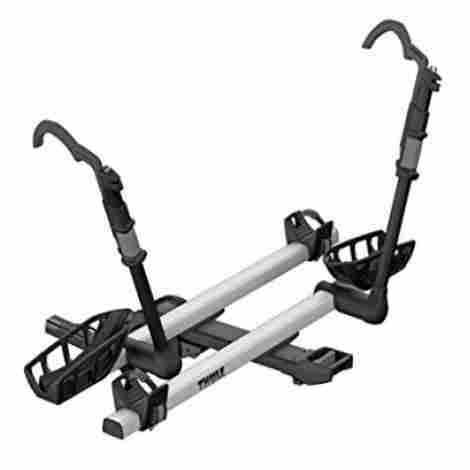 We can compare it to Allen’s 4-bike carrier - there’s some difference in prices but it’s not too big. Both models have different valuable features, so if you have some extra bucks sitting around, you may just find that Tyger suits you better! With its simple design, the Allen Deluxe 2-bike rack can be attached to many different types of vehicles. It also spares you the headache of assembling a dozen different parts. Additionally, it can be easily folded down to fit into the trunk when you don't use it. In the end, if you are worried about the stability of this simply designed and lightweight rack, you should know that people from Allen Sports have worked really hard to make both safe and durable 2-bike rack. Many bike racks require front wheel removal, but that’s not the case with Allen Sports Deluxe carrier. You can load your bike on the rack easily, and secure it using nylon straps with plastic buckles. The thing is that rubber straps are a lot faster and easier to secure than nylon ones, but you shouldn’t have any bigger issues if you tighten them right. The rack is attached to the vehicle also by nylon straps that have metal support arms with soft foam for safe contact with the trunk. This places the rack in a quite stable position but the drawback is that the trunk can’t be used while the bike rack is attached. In case you wanted a 2-bike rack and not the bigger one for 4-bikes, the Allen Sports model is one of the cheapest options on the market. It has its flaws, but for a 2-bike rack and considering its attractive price, it’s definitely a bargain! 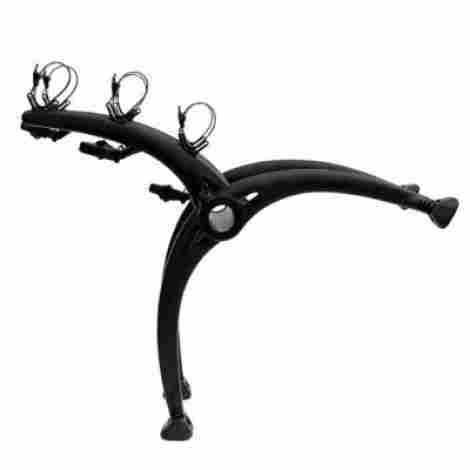 Saris Bones 3-bike rack has a unique curved design that provides an easy fit for many types of vehicles. You can load your bikes on this durable and stable car rack and start your adventure without any worries! Not to mention that you can choose the color of your rack and ride in style. People often worry about the durability of the plastic but there's no need for it when it comes to Saris Bones bike rack. This carrier is made from heavy-duty plastic which is highly durable and very stable, but it’s also fully recyclable. Speaking of materials, it’s worth mentioning that the carry arms are injection molded and therefore rust and proof resistant. The possibility of carrying 3 bikes separately and fully protected says it all about its stability and durability. The rack gets attached to the vehicle by nylon straps that have metal clips. This way of installing the bike rack on a car is among the fastest and easiest. The main concern may be damaging the paintwork because you will need to put the rack on and off frequently – it doesn’t allow full access to the vehicle when it’s on. However, the good thing is that the rack has a rubberized coating to protect your car from scratches. You shouldn’t have any problems with loading bikes either. They fit on the support arms and they're secured with anti-wobble straps, which allows you to transport various bike types on the rack. The downside is the lack of a locking mechanism. Even if you can purchase the locking cable separately, this kind of a bike rack should have it in the box. Another thing you should consider before you make up your mind – the rear bumper is a must if you want to use this rack! If you want a stylish bike rack that provides efficiency and durability, Saris Bones is an excellent choice. It comes with a fair value for the price, so you won’t be spending a fortune just to be unsatisfied with the product in the end. Even if you find that Saris isn’t the best pick for your needs, you can’t deny its high-quality features. 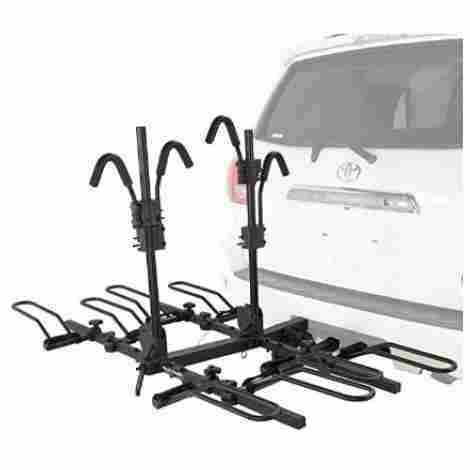 Hollywood Racks HR1400 is a heavy-duty car rack that can carry on 4 bikes. It mounts on a 2-inch hitch and it has wheel holders, as well as padded clamps that slide down on bike frames for full stability. Overall, the Hollywood car rack provides safe and effortless bike transportation, especially on long trips. Hollywood HR1400 car rack is one of the safest carriers on the market. We already mentioned that it has both wheel and frame holders for double protection, but there are a few additional features worth mentioning. First, the wheel holders are firm and durable, so they hold bicycles really tight to prevent any movement. They can also be adjusted if you need them to carry on both adult and children’s bikes. Secondly, the rack has a tension bolt that prevents any wobble, especially when the bikes are loaded on the carrier. People from Hollywood Racks made a real effort to provide a good locking system for your bike. Along with locking hitch pin that locks the rack to the car, they feature a 9-foot security cable to be sure that your bike doesn’t get lost while you’re not by the vehicle. The padded clamps can also be locked individually by padlocks with small clasps. The downside of this rack can be its weight (around 85 pounds). A heavier rack provides better protection and stability, but it’s also harder to install and it’s mostly unsuitable for other vehicles other than SUV’s. Storing this rack can also be challenging, but it can be separated into two parts for easier disposal. It can also be folded down for easy access to the vehicle’s trunk. Hollywood HR1400 is a high-quality car rack that’s really hard to beat in terms of value. It’s sturdy, durable and safe, but it’s also a bit overpriced. For people with SUV’s, this is a real deal, especially because this is one of the rare car racks that doesn’t wobble at all! However, others may find it unsuitable for their vehicles and also pricey. 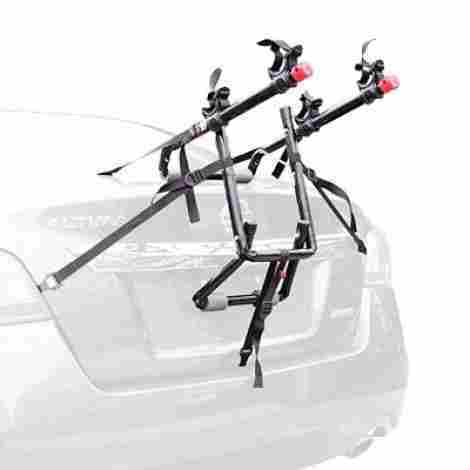 Yakima Hold Up rack is one of the best-selling bike carriers on the market. That’s probably because of its innovative features that provide easy bike loading and simple disposal. Also, if you wanted a rack that can hold various bikes models, Yakima is the right answer! The best thing about Yakima Hold Up rack is its innovative design. It has wheel holders and adjustable carry arms that clamp over the front wheels. In that way, not only that the contact between bikes is reduced to a minimum during transportation, but it can hold wheels of large size (from 20 to 29 inches). The rack can be attached to any vehicle that has a 1.25 or 2 inches receiver. The locking hitch pin secures the rack firmly to the receiver and prevents wobbling. It has the capacity to hold 2 bikes, but you can expand it with optional Hold Up +2 if you need to transport 4 bikes. Like we said above, because it has both wheel holders and clamps that go over the wheels, Yakima is an excellent option for those who have multiple different bikes. It can also hold heavy bikes that just can’t fit in higher or lightweight car racks. The rack can carry up to 60 pounds – way more than any bike actually weights, which means that it can endure a lot. When it’s not in use, Yakima HoldUp can be easily folded up in a vertical position so you can simply fit into the parking lot. Yakima also comes with cable locks for extra security. They’re quite useful, but they won’t stop a determined thief so you should consider adding more locks to the rack. Overall, Yakima HoldUp rack is built to last and makes all the hassle about bike transportation a lot simpler. Its price can be a drawback, but Yakima’s good customer service compensates that flaw. They offer full support for every issue. Tyger bike rack is designed to support 1 bike and comes fully assembled – there’s no need for additional work around the rack and consequently - no headaches! Tyger rack can be attached to various models of cars, which makes it a perfect pick for 1 bike simple transportation. The rack is attached to the vehicle by straps which are placed on the padded lower frame to keep the distance between a bike and a car. The loaded bike is fully protected from scratches with soft cradles. This is a great feature, but it may not support all types of bicycles, especially heavier ones. Although the rack provides great stability and protection, it weighs only 8.9 lbs. While this makes it easy to store and very practical for the transportation of many bike types, it doesn’t make it suitable for all of them. In the end, it’s worth mentioning that this rack is made from rust-resistant materials that make it durable. The best thing about this rack is its compact design. You can fold down the whole thing and store it in your trunk or any other smaller place. However, keep in mind that this rack isn’t suitable for cars longer than 18 feet. It’s very important that you check whether your vehicle belongs to this category. Although it doesn’t provide high-end features like other bike racks, Tyger is definitely more affordable. If you’re not a demanding group cyclist, you’ll be very satisfied with its attractive price and quality features. If you are always worried about the safety of your bike while you’re on the road, Thule T2 Pro heavy-duty rack is just the thing you need! It’s a 2-bike carrier designed to provide maximum protection to your bike as well as the vehicle. It comes with some great features and also some cable locks for extra safety. You may find that you need some help to assemble the parts of the rack once it comes to your doorway. It’s not too complicated, but you need about 20 minutes to get it right and set it to use. You’ll forget about this simple issue when you get thrilled about the possibility to mount almost any type of bike on the rack. The wheel holder can support almost any wheel type and size. It also provides space between the loaded bikes – because of the separate trays that hold the wheels, bikes don’t get in contact during the ride. A platform-style hitch rack has one advantage over other types of racks – it’s incredibly easy to load bikes on it. Not to mention that a wheel holder and carry arms provide extra support to the bike. Carry arms are also user-friendly - you only need to place them over the front wheel and tighten them so the bike doesn’t move. We also shouldn’t forget one of the most important features of this rack – it has a tilt mechanism that provides full access to the trunk. This rack is a bit heavy but it’s because of the quality metal materials and components. This provides higher protection and durability, but if you want something lighter for easy disposal you may want to search for another rack. Thule T2 PRO provides many high-end features but it costs an arm and a leg. You’ll definitely get what you paid for along with a lifetime warranty, but for many people, this is just an unreasonably expensive rack. If you enjoy a solo peaceful ride but you aren’t sure how to transport your bike without using a heavy car rack for multiple bikes, maybe it’s time for you to get the Yakima Highroad. This is a highly recommended top car bike rack that provides great features, but what is more important is that it makes the mounting as easy as it can be. The best thing with Highroad is that it can lay down on the top of your car without covering your plates or preventing you to access the trunk. You can just lift the bike on the top of your car and tighten it down in a few seconds. The bike wheel holder can support almost any wheel size! The downside of this design is that bike loading can be really difficult, depending on the type and size of your bike. Made from durable, solid materials such as heavy-duty metal and plastic that are rust-resistant, Yakima Highroad is a long-lasting bike rack. It provides great protection to your bike and eases your mind during the drive. If a wobble happens, after all, it’s noticeable only when you want to drive faster, but that’s the thing with almost every bike rack. On the other hand, they really could improve the locking mechanism. You only get a cable that goes around the bike’s frame and it’s probably not long enough for every bike type. Yakima Highroad is an excellent choice for a 1-bike car rack. Not only that it makes your bike transportation headaches go away, but it’s also easy on your pocket. From this point of view, it’s hard to see any bigger drawbacks of this bike rack. The most important thing for us to was that the chosen products could provide a high level of protection both for bikes and vehicles. There are many good bike racks on the market with great value, but they fail in providing essential protection from scratches when two bikes are too close during the ride. Not only that it was important for us that bikes stay in their place during transportation, but also to be secured by locking mechanisms. Some manufacturers put additional security cables in the box, some of them don’t, but almost every one of them has some kind of a locking mechanism both for bikes and the rack itself. It’s important that your bike rack is also in its place when you get back from cycling, right? The second important thing was determining the stability of every bike rack that was in the competition to be on our list. We know that some wobbling during the ride is normal and that it’s practically impossible to make one hundred percent stable rack because it’s often attached to the vehicle only by one or two points. However, there are racks that swing a lot which isn’t good! Racks on our list have proven to have less tendency to wobble during transport because of their high-quality materials and additional anti-swing components. Like with every other product, we want to know that we bought a long-lasting item. Car bike racks are quite exposed on our vehicles, especially when we go on a long trip where we can’t protect them as we should. Various weather conditions can seriously damage racks that are not rust or proof resistant, but that’s not all – it’s really important to have a rack that’s easy to store and take off the vehicle because both things can be damaged during the process. 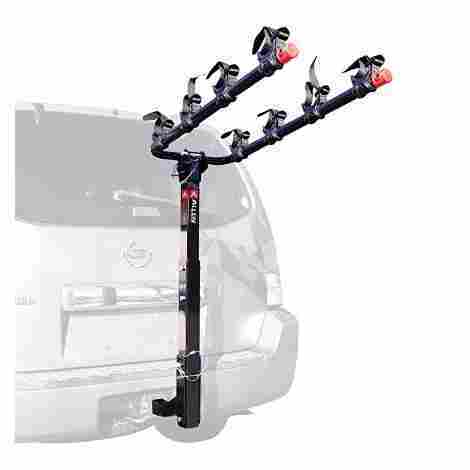 We have taken all that into consideration when evaluating our top best car bike racks. Car bike racks are usually not so cheap so we want to be sure that we get the most value for our money. There are, however, some cheaper products that can provide quality features and they made their way on our list. We have chosen the pricey ones too because it’s really hard to compete with their high-end features. Whether you have or you don’t have some extra money to spend on your new shiny bike rack, you should have the possibility to compare the value and the price of every product. That’s why we have done separate research for the cost and value of all bike racks on our list. We already presented you our criteria used in the evaluation of the best bike racks on the market, but there are always some things that are related to your own preference and needs. First thing first, think about the type of bikes that you want to transport on a bike rack. Some racks are lightweight, some of them aren’t, and that depends on the bike type that they are made to carry. If you need a 1 or 2-bike rack then you can go with the lightweight carrier, but if you want to transport more of them or even electronic bikes, you should consider buying a heavier rack. There’s also a catch when it comes to the size of the bike – some carriers can hold on bigger wheels but some of them can’t. You’ll find out that there’s always a compromise to make when it comes to finding the best bike rack. All racks have different features and they are not always in good terms with each other. However, you also have different needs when it comes to features, and some of them are a must, and some of them can be overlooked. Think about that before you make a purchase. Do you need a lightweight rack that can be easily stored? Or you need a heavy rack that can support your big bikes? Is it essential that you have full access to your trunk when the racks are on the vehicle? Do you want to have a rack that is easy to install and load bikes on it? These are only examples, but you can figure out where we’re going with this. Along with above-mentioned features, one of the first things you should figure out is what kind of rack do you want to attach to your vehicle. Is it a rack that attaches to the top of your car, or is it the one that can go on hitch or trunk? This is mainly a thing of preference because all types have their goods and bads. Q: Are car bike racks universal? A: No, they’re not. The ones that are attached by hitch require different hitch size, and the ones that are attached by straps require different trunk sizes. There are always racks that can be attached to most car types, but you should check that with manufacturer anyway. Q: Does my car insurance cover the bike rack as well? A: The coverage of the bike rack depends on the type of auto insurance. If you collided with something or someone and you have collision insurance, it’ll be covered. The same applies to liability and property insurance. However, if you’re planning to purchase a new bike rack or you already did, talk to your car insurance provider before you get on the road. That way, you will find out what you can expect in different situations. Q: Can I put a roof rack on a vehicle without rain gutters? A: Absolutely! Your vehicle still has rain gutters but they’re inside the door frame for better aesthetics. These days roof racks are mounted by rubber pads and clamps that go to the internal rain gutter. In that way, the racks stay secured, and they can’t scratch the paint from your car. Q: What if I want to change the vehicle and I already have a bike rack? A: Well, if you want to stick with your bike rack, you should aim to find a car where your rack can fit. This is easier if you have a roof rack, but for the trunk or hitch bike rack, you should check the size of the trunk and the hitch receiver. In the end, you can always purchase another bike rack.